Central Location close to subway and the Augarten, plenty of supermarkets including kosher ones nearby. Very friendly staff, kitchen has all the essentials to cook. All staff were friendly and willing to help; rooms were comfortable and clean. Great service and very friendly staff. Great view from the rooms. Spacious high ceilings and full amenity availability. Highly recommended. The apartment was very neat and comfortable. There were good amenities in the room. The windows had a roller shutter which blocked out all light which was good. The area was very quiet despite being very central in location. The transport connections nearby were very convenient. Modern 2-bedroom apartment (No. 7, 5th floor) with a kitchenette, bathroom and balcony. Both rooms + bathroom were spacious and super clean, huge balcony with amazing views over the city. Very comfortable. Perfect for 4 adults or a family with kids. Walking distance to the city centre, underground parking garage nearby. Overall a great value, definitely exceeded our expectations and would book again. 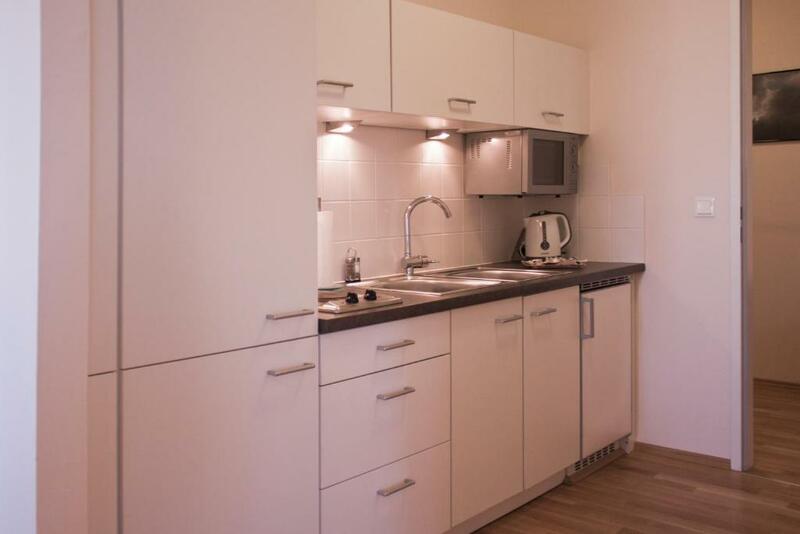 very roomy - small kitchen with fridge, microwave and cooktop. Pefect for the Kosher traveler. Near kosher food shops, and shuls. Staff supply hot water urn and "plata" for Shabbos. Excellent location - 1 min to get to the metro; two supermarkets within 2 minutes; safe neighbourhood; great views from the apartment and a great terrace (not entirely private as it is open for use to other guests as well - though no one was using it while I stayed there). The room was on the 6th floor of a nice old Vienna building (with new elevator installed), not noisy. Apartments are prosperous, easy to find, easy to check in. Can book a parking with them for extra price. It was very nice and clean apartmant, close to the city centre (15-20 minutes walking) also situated in very quiet area. Parking right next to the hotel is for free during weekends. We were nicely surprised. I can really recommend this place. Couple mins walk to underground. Spar just up the street. Apartment very warm. 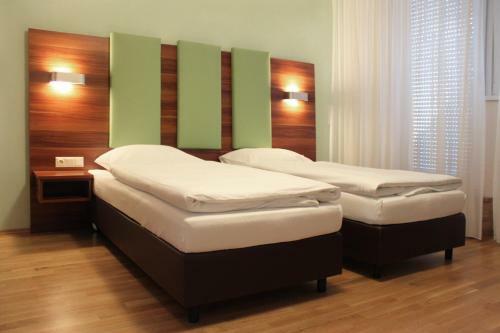 Lock in a great price for Sky Apartments Vienna – rated 8.5 by recent guests! Sky Apartments Vienna This rating is a reflection of how the property compares to the industry standard when it comes to price, facilities and services available. It's based on a self-evaluation by the property. Use this rating to help choose your stay! Sky Apartments Vienna offers modern apartments with free wired and Wi-Fi access in Vienna’s 2nd district, only a few steps away from the Taborstraße stop of the U2 metro line. The apartments feature a fully equipped kitchen and a bedroom with a big LCD TV. They have their own balcony or offer access to the roof terrace. 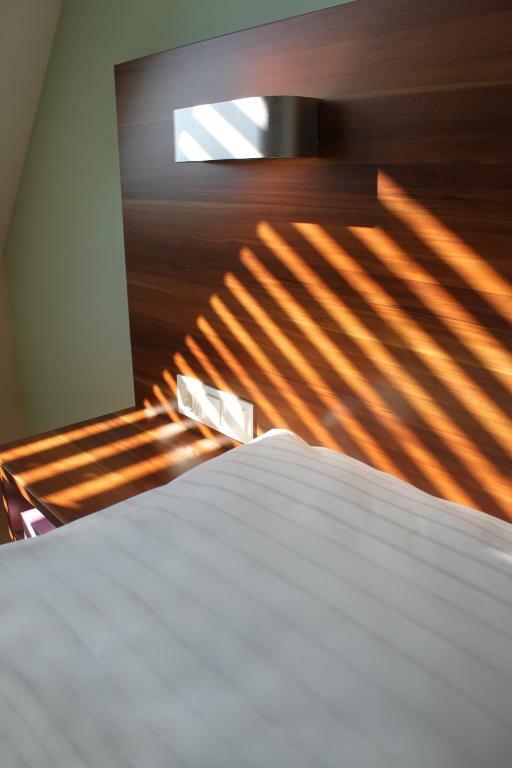 Sky Apartments Vienna is located in the upper story of a traditional Viennese building. There is a reception and an internet terminal in the lobby. Parking is available at an underground garage nearby. 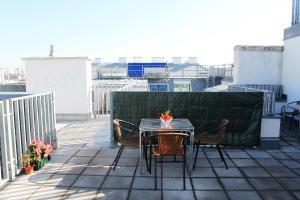 The Augarten (park) and the Prater (amusement park) are only a short walk away. St. Stephen’s Cathedral is only a 15-minute walk away from the Sky Apartments and can be seen from the rooms. When would you like to stay at Sky Apartments Vienna? Small apartment with 1 bedroom. Private parking is available at a location nearby (reservation is not needed) and costs EUR 15 per day. Spacious apartment with 1 bedroom. Possible bedding is 1 double bed or 2 single beds. 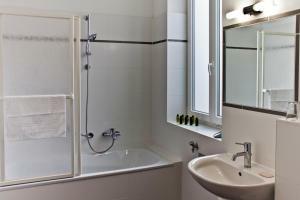 Spacious apartment with flat-screen satellite TV, a kitchen, and a bathroom with shower and toilet. Some have a balcony or a terrace. Apartment with a combined living room and kitchen, featuring 2 washbasins. Dishes cleaned according to kosher rules are available on request, and disposable dishes are also available. For shabbat, a hot plate and a kettle are available. Some of our Apartments have their own balcony, and for those which don't, we have a nice terrace for all our guests to use. You will find a welcome drink in your fridge, and the staff is willing to help you with all your needs. Dear Guests, we are a family run Apartment Hotel. Your happyness is very important to us, and we want you to feel at home. We have arranged our Apartments the way we would enjoy it ourselves, spacious, light and warmly furnished. We hope to see you. We are located at the heart of Vienna. The City Center is a walking distance of 15 minutes. There is an underground station which brings you to the city and to the best connections, just at the next road. Local restaurants are closeby to enjoy. Area Info – This neighborhood is a great choice for travelers interested in convenient public transportation, old-town exploration and monuments – Check location Great location - show map Guests loved walking around the neighborhood! 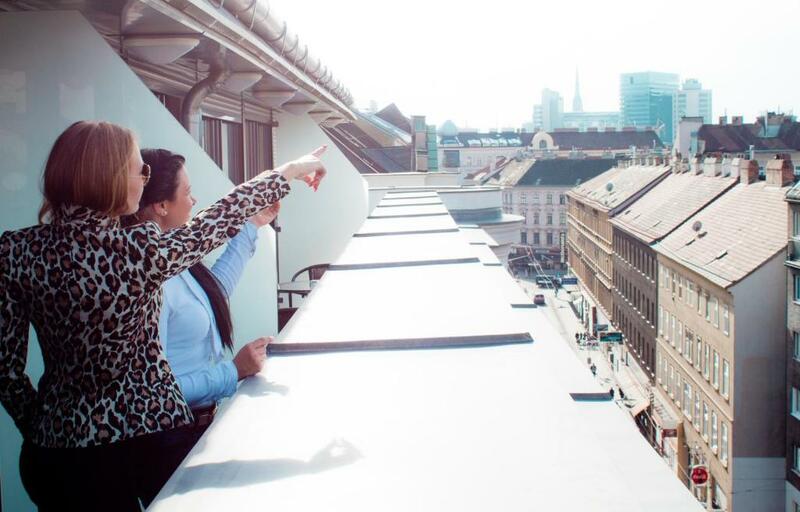 House Rules Sky Apartments Vienna takes special requests – add in the next step! Sky Apartments Vienna accepts these cards and reserves the right to temporarily hold an amount prior to arrival. If you arrive outside reception opening hours, please inform the property in advance. You can use the check-in machine during these times. The reception is open from 08:00 to 21:00 from Sunday to Thursdays, and from 08:00 to 16:00 on Fridays. Please note that since the reception is closed on Saturdays, all payments have to be settled until 15:00 on Friday. Please note that a special kosher breakfast is available on request for an additional fee. Please inform Sky Apartments Vienna of your expected arrival time in advance. You can use the Special Requests box when booking, or contact the property directly using the contact details in your confirmation. The shades of the only window in the bedroom didn't function well. Good location, clean and comfortable apartment. Kitchen table is not good, its like bar table, for 2 people, but not for family. parking is very difficult to get in with minivan. Small, hard beds with wheels. Breakfast only in the room without hot dishes. Really, it is not the hotel. Just 2 floors in the building. The staff at reception and cleaning crew did just the bare minimum. If I had not contacted them myself twice prior to our arrival we would not have known how to pick up the key. Bedsheets were not changed even though we stayed 9 days. And the cleaning staff constantly made us feel that we were bothering them by staying in the room past 9am, the time they would usually just walk into our room without even knocking first. No flexibility was shown regarding checkout time and the staff refused to put our luggage in a storage room (we had a late afternoon flight). We had to leave the luggage in the entrance hallway and hope for the best. Overall we felt very unwelcome. Kitchen utensils were disappointing, no sharp knife, no toaster so not easy to have breakfast at home before heading out for the day. This would not stop me staying here again though. 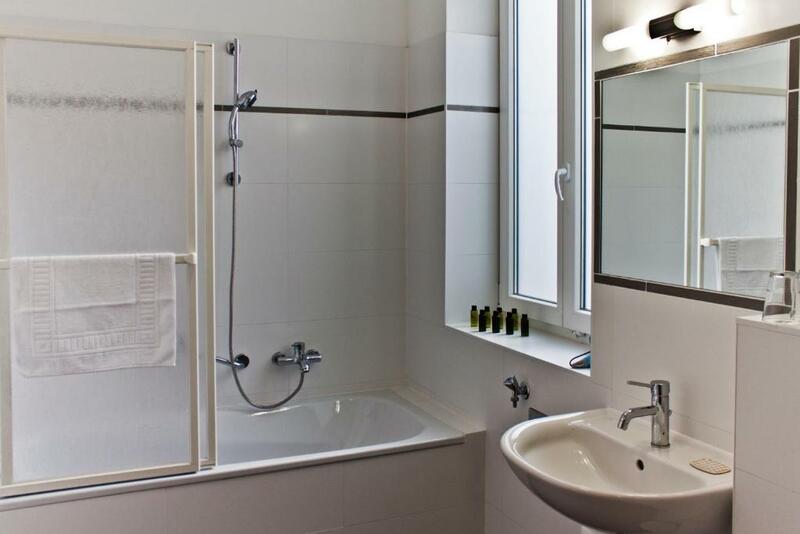 Excellent location, easy to find & great access to the rest of the city via U-Bahn which is 2 minutes walk from the apartment. It is very hard to think about any. 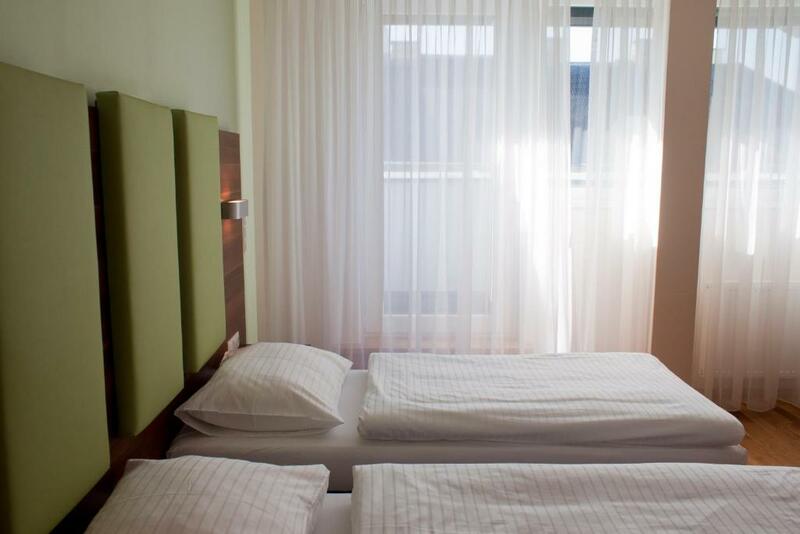 The only problem is that beds have wheels on one side, and because of it bed likes to move, but setting up wheels in rightposition should prevent this. Garage is like 600m away from hotel, but it is hard to believe it is possible to have private parking in city like Vienna. It was spacious and had a little private terrace. Lady at the desk was very helpful and friendly.